Situated in the northernmost parts of Scandinavia, the new EISCAT 3D radar will, when fully operational, be the single most powerful data source in the whole of Scandinavia. Producing 300 Gb/s of atmospheric data to be collected at high-performance computing centres, and an annual 10 petabytes to be stored and distributed to physicists around the world, EISCAT 3D will outstrip the capabilities of any similar radar operating in the world. For the next 35 to 40 years to come, it will be the centerpiece of the international network of instruments monitoring the Earth’s upper atmosphere and space environment. The Nordic research and education networks are preparing to put a whole new network infrastructure in place for EISCAT 3D, as the radar is situated in remote location to assure a minimum of background noise. EISCAT (European Incoherent Scatter) studies the interaction between the Sun and the Earth creating disturbances in the magnetosphere and the ionized parts of the atmosphere. These interactions also give rise to the spectacular aurora, or Northern Lights. The current EISCAT radar was taken into use in the 70’s. Now the construction of a new facility is scheduled to begin in 2016 and going into operation in 2018. Together with Norway, Finland and Sweden, the project is financed by EU, Japan, China, and Great Britain. The new facility uses a new radar technology with multiple antennas placed in a vertical grid, producing 3D images ten times more detailed than before. 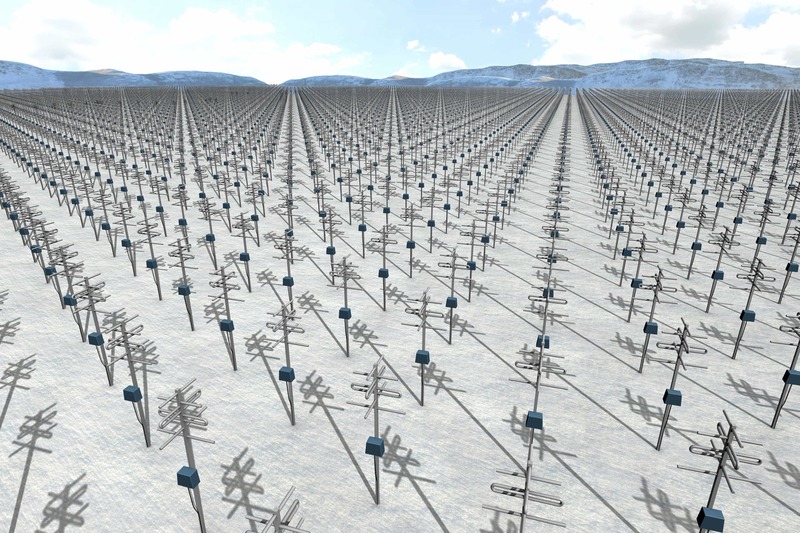 Three facilities are planned for the first phase of EISCAT 3D, each facility consisting of 9919 antennas. The sites are all situated North of the Polar Circle, but placed in three different countries: Norway, Finland and Sweden. The second phase will add another two antenna installations to the grid. New fibre optic cables will be put in place in the arctic region of Scandinavia to connect the radar sites to existing optical networks. The R&E networks in the region will be upgraded to handle a data rate of about 60 Gb/s going from each site to a Scandinavian supercomputing facility, and from there further on to researchers involved in EISCAT 3D projects. Without comparison, this will be the biggest capacity challenge for Nordic research and education networks yet. The EISCAT 3D facility will serve a range of scientific purposes. Among other things atmospheric monitoring for climate change, polar aircraft communication, refining positioning technologies like GPS and Galileo, observing meteor trail decay and tracking space debris. Besides, in 2008 the EISCAT facility experienced a brief moment of global fame well beyond the scientific community, when tortilla chip brand Doritos took a bold step communicating with aliens. EISCAT was used to beam a 30 second Doritos advertisement into a solar system in the Great Bear Constellation 42 light years away, being the first advert to be broadcast into space. Extra terrestrial Doritos fanciers have yet to visit Earth though.